Are you prepared to defend yourself in any emergency? 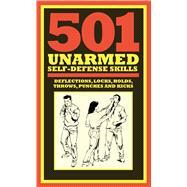 501 Unarmed Self-Defense Skills will teach you how to take down an opponent when flight is not an option. Whether you're faced with a fistfight or worse, these skills from survival expert Chris McNab will help you keep a cool head and form a strategy to defend yourself and get away as quickly as possible. Be ready for any situationno weapons needed! Chris McNab is a writer and editor based in South Wales, UK. He has produced over 50 books on military history, martial arts, survival, and other topics, and has written extensively on firearms. His titles include The Encyclopedia of Combat Techniques, Mental Endurance, Wilderness Survival, Prisoner of War Escape and Evasion, and Extreme Fitness.